The treehouse was the little girl’s sanctuary. It was like a giant dollhouse on a platform in the trees. Her Daddy had built it for her when she was only three years old. He had started when she was born. He worked on it all of his free time. He had designed it with real shingles and trim that made it look like there were always icicles hanging from the eaves. The little house had a steep roof and real windows that actually opened and closed. It was large enough for an adult to walk in without bumping their head. Only one room, it still looked like something out of a magazine. Daddy had painted the trim on the windows a burnt orange to match her hair, he said. Inside the walls were light green to match her eyes. He chose two soft chairs. They were big enough that she could curl up and go to sleep or sit in Daddy’s lap while he read to her. Reading reminded her of her mother. When Mommy felt well, she would take her to the library and she would check out as many books as she could carry. Mommy would do the same thing only in big people books. They would take them home, but Mommy would not read to her. Instead, she would tell her to go away and not bother her. That’s when the little girl would go to her treeshouse. When she was younger she would look at the pictures. As she got older she choose books she could read, but Daddy would still come and read to her, too. It was her favorite place in all the world, her shelter against the storms of life. Her mother was not well. Daddy told her so, but she already knew it. Everyone knew it. She was not like other mothers. Mommy had no soft, welcoming lap to curl up in. There was no constant source of love and warmth. There was no patient teaching. There was only confusion as one day she would be happy, singing and dancing. The next day she would be screaming, yelling and beating her daughter. So the little girl found her place of retreat built by her Daddy nestled in the tree. Her Daddy had told her to go there in case something happened and he wasn’t home. So she went there often. The tree, a sturdy oak, had strong limbs to hold the small house for it was indeed a house built just for her and Daddy. Mommy wouldn’t climb the ladder. She was afraid of heights. She was afraid of everything, especially life. The little girl was eight now and hurried home from school eager to climb up into her treehouse and read a new book she had gotten from her teacher. She ran all the way, up the steps, threw open the door to the family home. Immediately she knew something had changed. In the living room sat her father, his head in his hands. She quickly glanced around the room, but did not see her mother. Daddy took the little girl in his strong arms and sat rocking her for a long time. Then, he warmed up some chili from a can and they ate supper in silence. He read her a story from her new book. There was no need to climb the ladder to the treehouse. 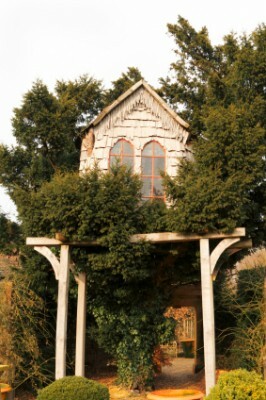 Before going to sleep, the little girl looked out the window of her room to the treehouse in the yard. Usually the streetlight lit the little house so it always looked warm and inviting like someone was there, even when they weren’t. Tonight, though the house was shadowed and dark. She missed being nestled in the big chair with her Daddy. She missed being in her very own place in the world. Glancing at the treehouse one more time, the little girl couldn’t help but feel sad. It seemed her beautiful treehouse was sorrowful, as well. It was like it knew a secret she couldn’t quite grasp. She had no idea of what tomorrow would bring, but she knew one thing for sure, it would be different. Even though her mother had not been well, she had been there. And now, she was gone. There was no more need for sanctuary. When do you need sanctuary and what is sanctuary to you? That is such a touching story, Teresa. I have never really had a problem like that to hide from. If I feel overwhelmed I usually go to my room to pray. If I don’t want anyone else to know I’m crying I take a shower. Sometimes I even go outside to cry out to God. It all depends on what the problem is at the time. I think we all need sanctuary, a place where we connect with ourselves and with God.